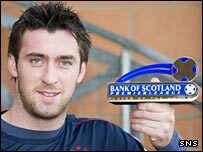 Allan McGregor hopes that being named Scottish Premier League player of the month will help him find a new club if he returns to Rangers' bench. The 24-year-old had some fine displays during September while Lionel Letizi and Stefan Klos were injured. And goalkeeper McGregor said: "If things do not work out here, I can go for nothing in the summer, so I have to put myself in the shop window. "Hopefully, I have done enough to catch someone's eye." McGregor was on loan to Dunfermline Athletic last season and it looked like he could leave Ibrox on his return. But injuries to long-serving Klos and then new signing Letizi gave the Scot his long-awaited chance of regular first-team football. "Of course, I would consider staying if I was told I would be number one," said McGregor. "It is a massive club and I have been here for many years - I would be delighted if that happened. "Hopefully, I have given the manager a selection headache. "I have just tried to be consistent and take it game by game, but I have been pleased with my performances. "I am the wrong man to ask whether I will stay in the side though. "I would never have dreamed of this. I heard Stefan fell off his bike in June when I was on holiday, so I thought it would be a bit hard for me to move as I would be number two. "But I asked the manager and he said I could go, but nothing really materialised. "I obviously want to play, but it is up to the manager to pick the team and I will take it game-by-game. "Lionel and Stefan are both back in training now, so I just need to wait and see. "It's been a great month for me as I made my European debut and my Old Firm debut as well. "It means a lot to get this award. As I have said before, last year helped me out a lot at Dunfermline and I really enjoyed playing first-team football. "I was dying to get that again this season and I have been fortunate the way it has worked out with Lionel getting injured, but I'm happy to get the chance."